What is your musical background and how did you come to experimental music? I had childhood piano and violin lessons, which were fundamental musical experiences for me. But for contemporary music, I have a friend who works as a curator at the Royal British Columbia Museum here, and he had a substantial analogue synthesiser collection in his basement. I went to school with his daughter, and one day when I was about eleven or twelve years old, I was at their house and he said ‘Do you want to see the synthesiser collection?’ I said ‘Yes absolutely’, and as I remember he had Moogs and a working Mellotron – it was just wonderful for a twelve year old kid. He was showing me some of the oscillators and so on, and then he said ‘Do you want to take home some music that sounds like this?’ and he handed me a stack of vinyl records. There was the Xenakis electroacoustic LP from the 70’s on Nonesuch, there was Stockhausen’s Gesang der Jünglinge and Kontakte, The World of Harry Partch on Columbia, and I took these home and I just played them over and over and over again. Did you like them immediately or were you just curious and gradually come to like them? So my early contact with contemporary music was largely through these recordings, and then there was a CD in the public library here of Cage’s ‘Indeterminacy’, and digging through back issues of Rolling Stone magazine in my parents’ basement, I found a review of it which said something like ‘This is a record you must have in your collection. Sometimes the piano and other sounds obscure Cage’s voice, but that’s ok’. Which mattered to me, someone saying that it was totally cool even though it was so different from the bulk of what Rolling Stone was reviewing. Did the itch to compose start at that point, or did it come later? I certainly have; Cassandra Miller said that the first hour in that class changed her from wanting to be a harpist to wanting to be a composer. Yes, before taking that class I hadn’t really connected the dots that you could be a composer of music that sounded like twentieth century music and still be active, or even alive. I’d never really thought that you could be composing right then and there, you didn’t have to be in Paris or New York or Winterthur or something. So, if I remember correctly, when he started us doing composition exercises Christopher Butterfield said ‘Your first exercise is to write a piece with one note’. So we all wrote pieces with one note, and I remember I wrote a piano piece that was all A flats, with two or three A flats per bar, so there was quite a lot of silence even then. And I remember I didn’t want to write out all the flats again and again, so I put a single flat in the key signature, which amused Christopher. So if you didn’t set out to become a composer, what did you think you were training to be when you started at the University of Victoria? Through most of my adolescence my assumption was that I’d become a violinist in an orchestra, but I had a back injury in high school which meant that that wouldn’t happen. Once I got to UVic I played percussion in the university orchestra and thought well, I’ll see what happens, but it was really up in the air what I’d do, I just knew it would be music. Do you still play an instrument, or do you just compose now? During my time at UVic my playing turned largely towards mandolin and guitar, which I’d played as a kid as well, but these are the instruments that I play for ‘A Place to Listen’ and the Victoria Composers’ Collective here. Are the pieces on the CD all composed within the past couple of years? 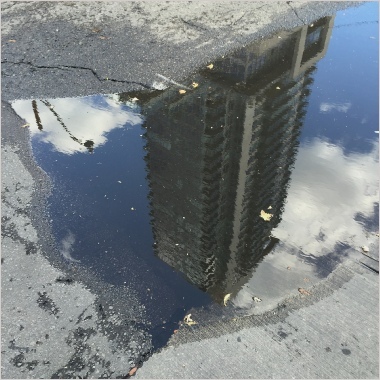 Yes, the oldest piece is distributed tourism, which I composed for A Place To Listen in 2014. One of the things I like about any three players is that as well as the foregrounding of unstable sounds, it has a melodic impetus as well. Is that interest in melody a new thing in your work? Yes, an interest in line, or stepwise motion, is something relatively new, within the past 2 or 3 years, as a way of providing a ground, or some kind of support for these transitory, fleeting sounds that I’ve always liked. When Philip Thomas saw the score of any three players he said ‘This is just like Christian Wolff’. Is he another major influence on you? I wouldn’t characterise him as a deliberate influence, though I’ve been familiar with his work for a long time. In fact I wrote an undergraduate paper on his 50’s piano music (Duo for Pianists and For Prepared Piano), and I can see that there are similarities with the approach to performance in his later works. There’s an openness, a looseness and languidity that could perhaps be linked to Wolff. Moving to Europe would be lovely, getting back across the pond with all the stuff that’s going on in England or The Netherlands. I’m playing more and more music by, say, Leo Svirsky and Anastassis Philippakopoulos. There’s a lot of great stuff happening that I’m trying to be a part of from over here. So do you feel a bit out of a limb in Canada? I used to, but there’s been a kind of demographic shift here whereby a large number of people in the past 6 or 8 years who went through the UVic composition programme have stayed and set up their own ensembles so they can be involved in composing and playing their own music. That has made Victoria an active and attractive place to be, but part of me still hankers to go abroad. In her interview Linda Catlin Smith says that she feels there are advantages to being in Canada, removed from the major traditions in Europe and the USA. The downside is that it’s hard to get noticed, but the upside is that you’re ‘unexamined’ and so free to compose however you like. I really like that word ‘unexamined’. I think there is a whole bunch of stuff here that people don’t really know. Going back 40/50 years you get, say, graphically notated choir scores by R. Murray Schaeffer and music by people like Barbara Pentland, never mind everything that’s going on today. I find it a strange comfort that the spotlight is not on you, not here on the West Coast of Canada anyway. 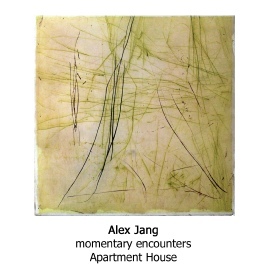 “Momentary Encounters offers up a selection of fragile, languid, & often extremely sparse examples of modern composition from Canadian composer Alex Jang. The four tracks utilize a relatively varied – but often paired-back sonic pallet that moves from blends of field recordings & wood wood, mixes of percussion, string & woodwind, and guitar. This CD is the 7th release in Another Timbre's Canadian Composers series- which highlights the cream of the crop in Canadian modern composition. The release comes in the label house style minimal mini gatefold packaging- featuring sparse black texts against a white background. And for this releases front cover picture we get fittingly stark painting by Lance Austin Olsen- that takes in a series of black & green scrawls against an off-white backdrop. 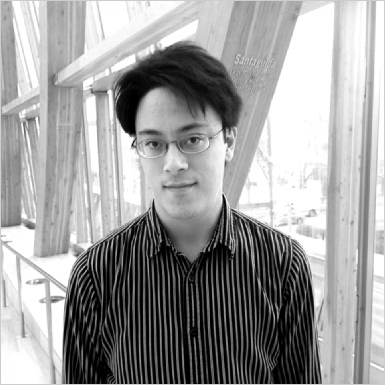 Alex Jang is a composer/conductor/guitarist who studied composition at both the University of Huddersfield & Victoria. He has been composing since 2013, but Momentary Encounters is his first ever released CD, and I must say it’s a fairly impressive debut- severing up a mix of extremely sparse yet fairly inventive modern composition. The four pieces here date between 2014 & 2017, with runtimes between nine & near twenty-five minutes. 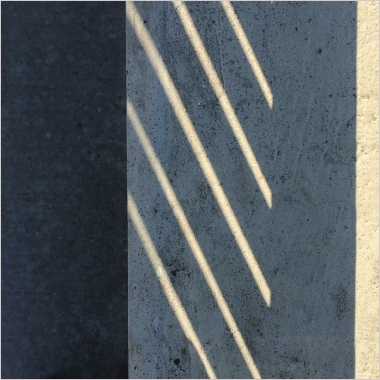 Opening up the album we have "Momentary Encounters (5)" this nearing sixteen-minute track sees the blending of a field recording ofTooting Bec Common, and the lulling & spaced-out weave of Heather Roche’s Clarinet playing. Ones mind initial gets sucked into trying to hear & define the distant mix of birdsong, water rush, children chatter & occasional dog bark. But fairly soon we get the introduction of the gentle sustained hum & blow of the Clarinet, which at first seems quite alien- but then quickly melds it’s self into the field recordings to creating this feeling lulling melancholia- which one sometimes gets on a hazy summers day, when the rest of the world is quietly buzzing away in the background as you sit in contanplaintion. Later on, we have “A Gray, Bent Interior Horizon”- this nearing ten-minute piece from 2016 sees Christian Alvear playing a series of tightly plucked ‘n’ picked, reverb-less & decidedly sour guitar motifs- which at times almost hint at structure/ harmony, but never quite get there. The piece very nicely captures a feeling of blunt numbness, and stark emotional dwell, with a very subtle vein of fading playfulness. The album is topped off with the longest work here 2014/2017’s "Distributed Tourism"- which sees emotionally clipped & solemnly flowing mesh of violin, vibraphone, clarinet, flute & cello notation. These elements blend together to create a felt, wavering, and at times uncertain & slurred march- which subtle simmers with fragile wonder, lulling- yet- fraught harmonics, & emotional unsure-ness.